Do you struggle to attract readers to your blog? Are you looking for blog marketing and promotion ideas that will bring more of your ideal customers to your business blog? Most bloggers struggle at some point to bring in new readers, and then turn readers into subscribers. Over the years, I’ve written a number of posts about promoting your blog. However, every few months a new tool or platform arrives on the scene that can have a huge impact on how you market your blog. In addition, some of the tactics I promoted in the past have become less important or even irrelevant, like blog directories or pinging news aggregation sites. 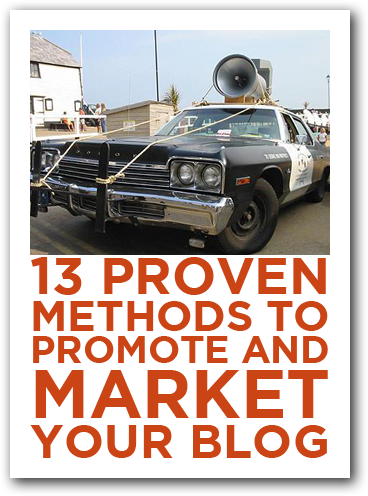 In this article you’ll find 13 proven strategies for increasing your blog’s visibility and attracting more qualified traffic TODAY! 1. Create keyword-rich blog posts. Focusing each blog post on a keyword phrase that your ideal customer is using at Google or Bing is critical to increasing more qualified traffic. You can uncover which phrases are most likely to work through a combination of surveying your current readership and performing a keyword analysis. Once you know your keywords, work them into your post title, opening paragraph, and reuse them a few times throughout your post. You don’t always have to use the exact phrase, and you can break up a multi-word phrase into smaller, non-connected pieces. The most important step is to create a powerful, keyword-rich title. For more on that be sure to check out What Should I Title My Blog Posts for Maximum SEO? 2. Write guest blog posts at other blogs. Creating inbound links to your site (which helps with SEO). Being introduced to a new audience who will want to learn more about what you have to offer. Find influential blogs that target your ideal customer. Read their posts, comment on them, and become part of their community. When you’ve become an active participant reach out and offer them a post that will support their goals and help their audience. Not all influential blogs will accept posts, and most have strict editorial standards. However, the barrier to entry makes your post more valuable. Google [“guest blog” + (your industry/topic)]. Lots of blogs are looking for free content, so they’ll be happy to publish your blog post. They may not have the readership of the influential blogs in the above example, but they can still drive quality traffic and generate inbound links. Use My Blog Guest. This website is a market place for people who are looking for guest blogging opportunities and guest bloggers. My experience has been that the guest blogging opportunities here aren’t as good as the first two options, but that may have to do with the industry that I write in. Regardless, it’s a great place to start establishing your voice and create new inbound links. 3. Offer an Email Subscription. 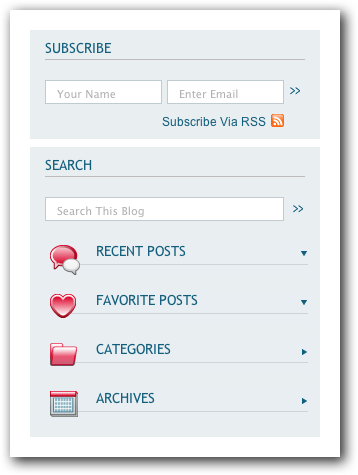 Years ago I recommended an RSS feed for blogs. Then I realized only a few select people actually subscribe to an RSS feed, so I suggested an RSS > email newsletter solution. This allows people to get your blog updates delivered right into their email inboxes. This was a nice solution because tools like Feedburner or Feedblitz would create the email version automatically for you…nothing you needed to do. These tools would turn your blog posts into an email and send it out “as is” to all your subscribers. There was no additional work on your end once you set them up. These days, however, I’m leaning away from these tools. Here at The Marketing Agents I use AWeber, and I personally craft each email I send out. 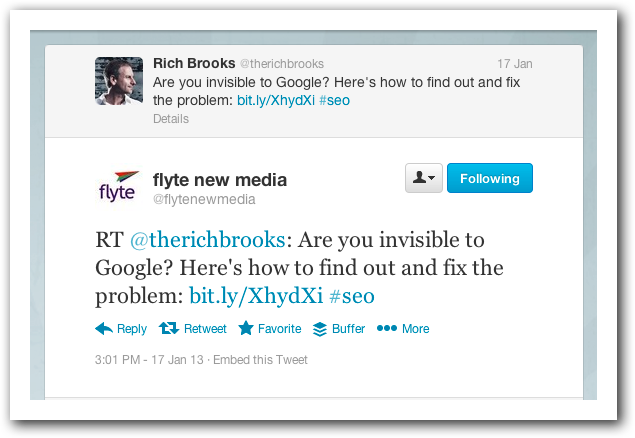 At flyte new media we use Constant Contact, so you can use whichever platform makes the most sense for you. She responded that by personalizing the email, teasing the content, and sending people to her blog she made it easier for them to comment on and share her content. It was a big “uh…duh,” moment for me. 4. Make sharing easy with sharing buttons. Like tip jars, sharing buttons reminds readers that you want them to share your content with others. Since too many share buttons can confuse your readers and clutter your design, only use the share buttons that make the most sense for your audience. B2B blog? Include a LinkedIn button. Lots of recipes or DIY craft project posts? Then make sure Pinterest is at the top of your posts. Some bloggers also like repeating the buttons at the bottom of a post, and some like the sharing buttons that slide down the post as the reader scrolls down. Do what works for you. Also, have you ever wondered why bartenders put in the first dollar (or two) in their own tip jars? It primes the pump. It acts as a powerful form of social proof that others have found the service “tip worthy” and therefore the socially acceptable behavior is to tip when you get your drink. Likewise, it’s a good idea to hit all the share buttons on your post after you publish. Not only will this encourage others to share, a zero share button looks kind of…lame. 5. Use Google+ to improve your SEO and drive more traffic. Google does care if your blog is integrating Google+, however. The bottom line is that right now Google+ influences Google search results and that’s reason enough for you to use it. G+ will give a leg up if you’re launching a brand new blog and it will push you farther if you’re already established. Make sure you have a link back to Google+ on your blog. Create a G+ account for you and your business and have a link from there to your blog. Start posting relevant content to your personal and business account on G+. If this last bullet point makes you curl up into the fetal position in the corner, you can skip this step for now. The first three bullets will help you and you don’t have to do anything more after you set them up. 6. Tweet (& retweet) your posts. Once your post is up you’ll want to share the post with your Twitter followers. I will often tweet out first from my personal account (which has the biggest following), then retweet from flyte and Agents. I use TweetDeck for tweeting, and use the scheduling feature to delay the retweets for an hour or two so it hits a wider audience. While I’m not a fan of automation, I do find that scheduling tweets helpful and effective. I will also tweet a similar tweet out later that day, or even a few times (always retweeting from the secondary accounts) to try and reach as wide an audience as possible. Since Twitter frowns on you publishing the same exact tweet, I try and reframe the title or main benefit of the post with the link in subsequent tweets. 7. Share your post on Facebook. Originally I used to recommend NetworkedBlogs for this task: a free Facebook app that would automatically publish your new posts to your profile and/or business page. However, when you post from a 3rd party app (like NetworkedBlogs or Hootsuite), Facebook de-emphasizes your post, meaning less people are going to see it. Now I recommend that you take an few extra moments to post a link to your new blog post directly into Facebook, since those few seconds can translate into a higher percentage of your friends and fans seeing your post. The Social Media Examiner has a great tactic for sharing blog posts on Facebook. They wait until the post has gotten a certain number of shares, then they take a screen grab of the article, including the shares, and post that to their wall. Not only do images get more traction in the newsfeed, (likes, comments, shares and click throughs,) the “social proof” of the retweets acts as an influencer to get fans to click through to the blog post. 8. Make your posts pinnable. Pinterest drives more traffic than Google+, YouTube, and LinkedIn combined. It also drives more traffic than Twitter. 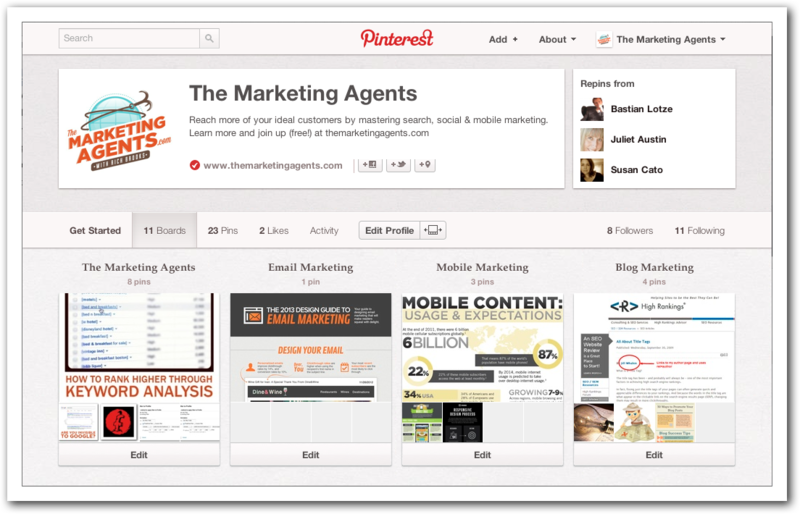 In short, Pinterest can deliver lots of traffic to your website. The thing to keep in mind is that Pinterest is a very visual platform. To maximize your success on PInterest you need to create at least one very pinnable image per post. I usually start with an image I feel is representative of the post and visually impactful. I then pull it into Photoshop (although there are plenty of free image editing software programs you can use), and add a caption to the image. That gives people on Pinterest an idea of what they’ll find behind the post. Although I’m far from a Pinterest expert, my early experiments on this blog have been successful. 9. Leverage LinkedIn for B2B blogs. There are three main places to promote blog posts on LinkedIn: your personal updates, groups you belong to, and company pages. I haven’t had much luck with company pages, so I’ll focus on the first two. I generally only update my status once, maybe twice a day. I’ve found that sometimes someone will share or like my update, but don’t get a whole lot of traction on it. I get much better results when I promote a post in a group. Many of the LinkedIn groups I belong to are local, but your best opportunities may lie in groups that are made up of your target audience. By posting directly in these groups you’ll get more traction, your post will hang around longer, and you’ll be able to reach people who may not be following you otherwise. 10. 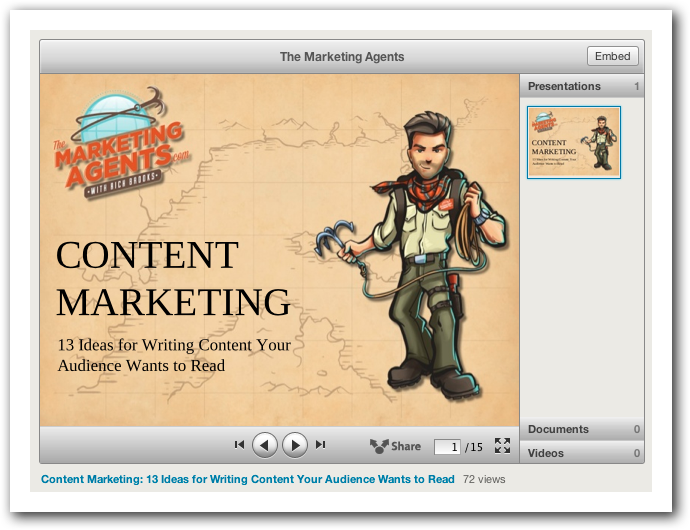 Convert posts into presentations for SlideShare. Whether you’re a one-person show or you have a team, it’s important to make your content go as far as possible. If you’ve got a “tent pole post,” consider converting it into a PowerPoint or Keynote presentation and sharing it on SlideShare…a site that’s like YouTube for PowerPoint. You can include clickable links in the slide deck and the description back to the original post, and reach an entirely new audience for just a little additional work. Here’s an example of a slide deck I made based on a content marketing blog post I wrote. 11. Submit it to AllTop. Years ago I suggested long lists of blog directories that bloggers should submit their site to. Since then, Google has downgraded the importance of inbound links from directories, and I find that their value as a referrer has also decreased. However, Guy Kawasaki’s AllTop continues to provide value for sites that get listed. So, head on over to AllTop, find the category that best suits your blog and submit it there. 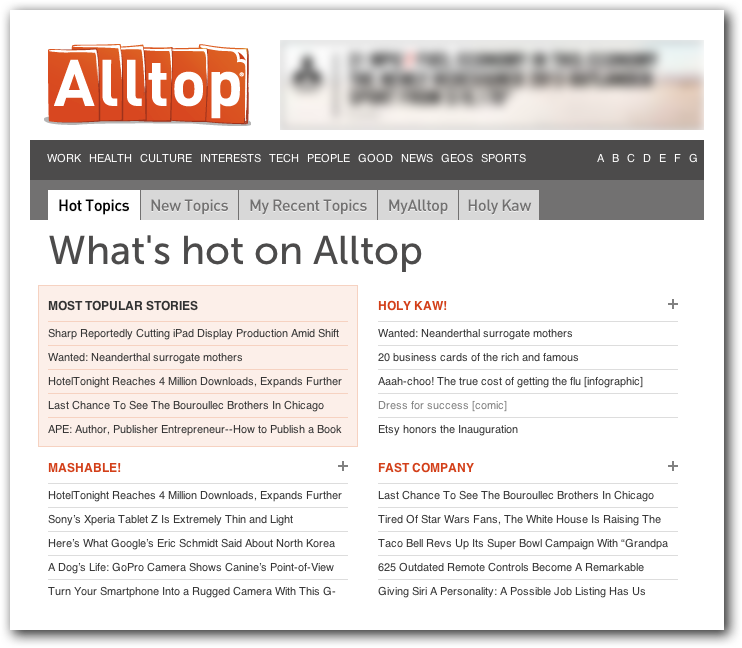 Chris Brogan has a nice post on How Alltop Powers Bloggers, and Affiliate Help has an article, Get Traffic with Alltop, that suggests contacting AllTop to directly to gain visibility there. 12. Leverage StumbleUpon to generate traffic spikes. I’ve seen StumbleUpon generate tons of traffic to new websites with little search engine visibility, and I’ve seen great traffic spikes for specific posts. My personal experience has been that StumbleUpon loves list posts. Years ago, a list post I wrote for FastCompany on business books exploded because of StumbleUpon, and at the flyte blog, 50 Creative Uses for QR Codes, was our most trafficked post ever, due in no small part to StumbleUpon. 13. Establish credibility with the author tag. Have you ever done a search and seen a photo of the author appear next to a result? That’s because he or she is using the author tag. The author tag makes your search result more eye-catching, and evidence suggests that it will improve your click-through rate. Social Media Examiner has a nice step-by-step How to Add Google Author Tags to Your Blog for Improved Search Results. If you’re just starting out, I’d focus on the items that fall under “set it and forget it.” Author tags, social sharing buttons, etc. Once you have things up and running, then you can start to add some more marketing tactics, like guest blogging, Alltop and others. What other tactics have you used to promote your blog and drive more traffic? Please let me know in the comments below. And if you have any blogging friends, please let them know about this post. Thanks! 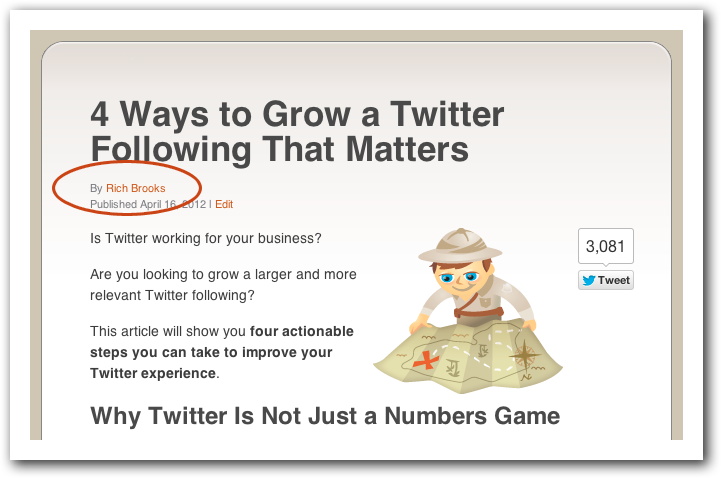 This entry was posted in Blog Marketing, Content Marketing by Rich Brooks. Bookmark the permalink. I find Hootsuite very useful to send teasers to all of my platforms simultaneosly. You can even do this live – so if I’m reporting on an event, I login to my hootsuite account, post once and my comments appear immediately across 6 different networks and pages. If that’s working for you, great. 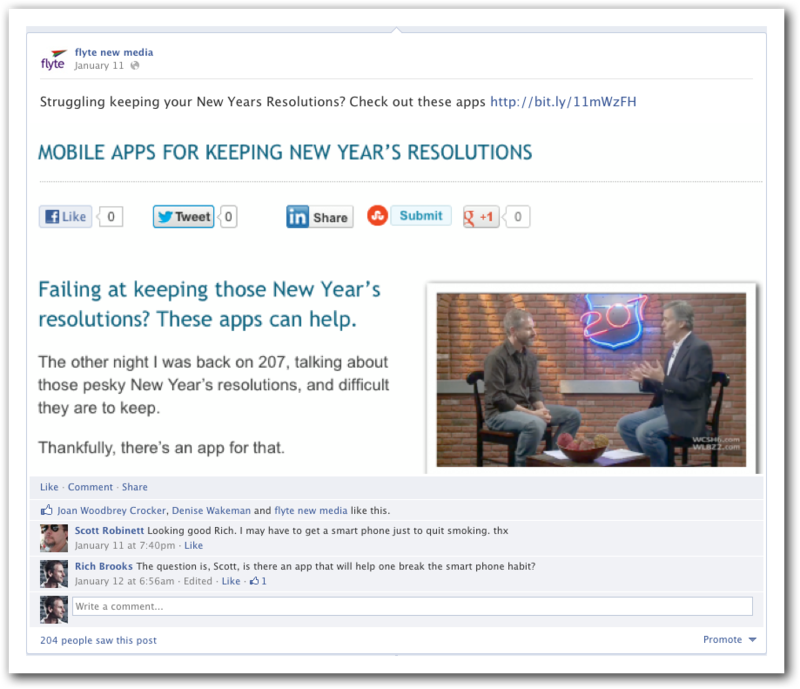 My only point is that certain platforms–Facebook specifically–will lower your engagement by using this 3rd party app. YOU need to decide if the tradeoff is worth it. I can understand that if you’re publishing to that many pages/platforms that some level of automation is helpful. Another very useful post. For a novice such as myself this gets a little out of my range, but still there are some good basic points. The suggestions for keywords in the post is very helpful. I have only recently ventured into LinkedIn and Facebook, which I’m not even sure that I rank novice in those at this point! I am exploring Pinterest and thought that it would be the only other one that I would use, but you have peaked my interest with StumbleUpon. For those of you out there (and Rich) helping customers with websites, social media and SEO, you definitely earn your money! I’d start with the keywords, but I was an SEO guy before I was a social media guy. I just feel that for evergreen posts (ones that will still be valuable years from now) that SEO offers better ROI than social media, which is so fleeting. That being said, focus on just using one or two tips that help get YOU in front of YOUR ideal customers. This post is killer. I learn in this post like more than reading 2 books. Thanks a lot for this information. I am building my website now and I can wait to implement this strategies. I think it will be awesome. Good luck with your website and let us know when it launches. I cannot believe that I completely missed adapting the tools I use to promote my personal blog for business. Thanks for providing this focus. Ha! Well, we all have a blind spot. Luckily all of these resources can be implemented quickly. Woa, I just bookmarked this post. Some great tips and resources here, Rich, that I hadn’t even thought about. Quick and easy to implement, too! Thanks for putting this together. Thanks for checking in, Rick! One lesson that’s really been brought home to me lately is how much promotion you have to do for each post. Many of the top bloggers reverse the Pareto Principle: 20% of your time is spent creating valuable content, 80% promoting it.